Upgraded Ocean Wave Projector: With Remote controller & touch senor button, dual-optional and more convenient for operation. A great soothing projection night light . 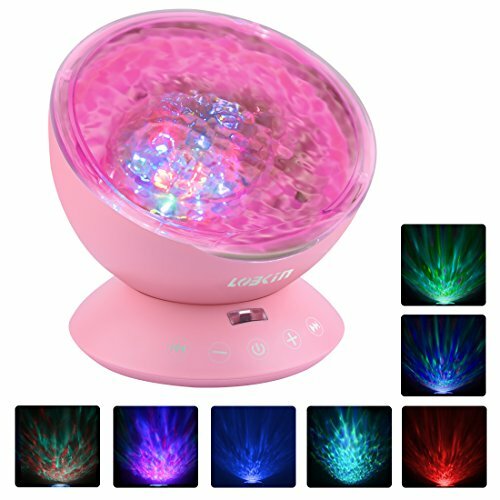 Built-in speaker: Volume adjustable, you can plug in an ipod, iphone, MP3 or other device with the AUX cable in the package, and play lullaby music, relaxing, meditation music through the night light projector while watching the aurora at night. 3 Auto Off Timer: Built-in 1H, 2H, 4H auto off timer, the lamp will automatically shut off after the preset time. Timer can be canceled to stay on all night long. Adjustable Display Angle:45 degree tilt, allow you to project the light straight up or point in a different direction, convenient for you to cover a larger area and get the wide panoramic effect.